Binding specificity of Cas9-guide RNA complexes to DNA is important for genome engineering applications, but how mismatches influence target recognition and rejection kinetics is not well understood. 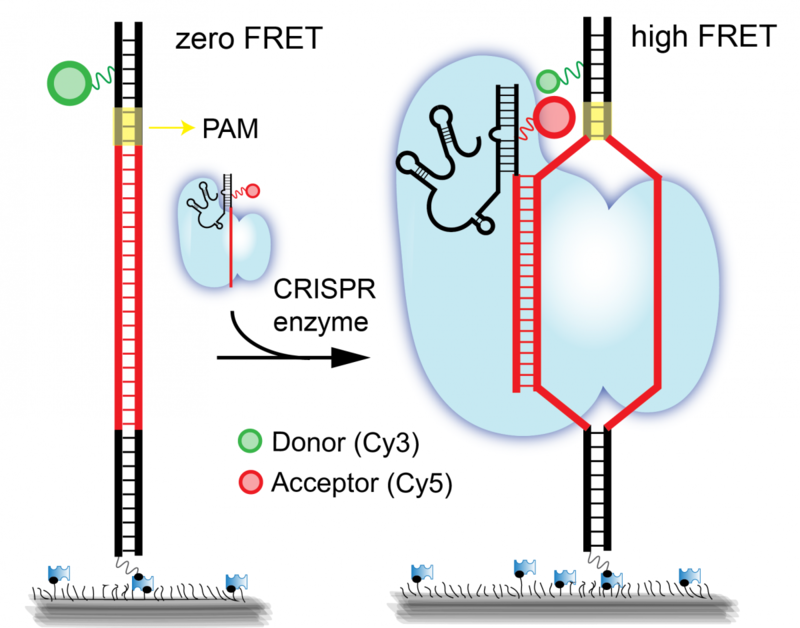 We used single-molecule FRET to probe real-time interactions between Cas9-RNA and DNA targets. The bimolecular association rate is only weakly dependent on sequence, but the dissociation rate greatly increases from < 0.006 s-1 to > 2 s-1 upon introduction of mismatches proximal to the protospacer adjacent motif (PAM), demonstrating that mismatches encountered early during heteroduplex formation induce rapid rejection of off-target DNA. In contrast, PAM-distal mismatches up to 12 base pairs in length, which prevent DNA cleavage, still allow the formation of a stable complex (off-rate < 0.006 s-1), suggesting that extremely slow rejection could sequester Cas9-RNA, increasing the Cas9 expression level necessary for genome editing thereby aggravating off-target effects. We also observed at least two different bound FRET states that may represent distinct steps in target search and proofreading.